Local politics is heating up as another notable local is leaving a perfectly good career to enter the Brantford mayoral race. Martin Dixon, CPA, CA, LPA and Senior Partner at Millards Chartered Professional Accountants in Brantford understands the risks but believes that the issues are too important to ignore. Topping Dixon’s priorities are repealing the law of gravity and ensuring higher education for Brantford by building taller schools. 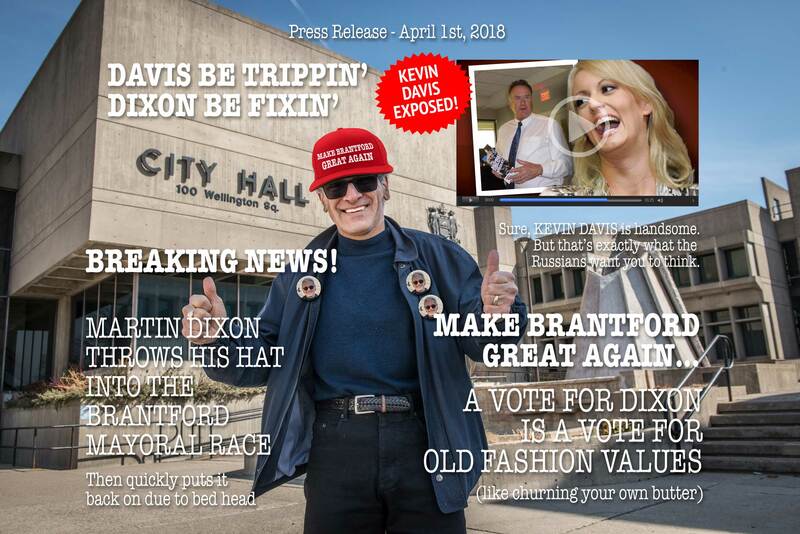 Dixon is also focused on better weather for all Brantfordians. Among Dixon’s more controversial suggestions is a plan to reduce driving congestion in the downtown core. While Dixon will miss his work as a Senior Partner at one of Ontario’s largest and most prestigious accounting firms, he believes his experience and financial expertise will help balance Brantford’s books. Dixon’s announcement comes on the heels of another that surprised the city. Kevin Davis, a lawyer at Waterous, Holden Amey Hitchon in Brantford will be a mayoral candidate in the Oct. 22 municipal election. Hinting that Davis “probably has something to hide,” Dixon has launched a rather aggressive TV attack ad. Dixon’s departure might come as a surprise to his coworkers. Share this page with your friends, co-workers and the community!